"I have never been pandered to so effectively before." And a lot of people are writing about it. It hits a sweet spot at the nexus of a much-loved niche publication saying goodbye; a presidential candidate using contemporary, zeitgeist-y campaign tactics; and, of course, your ever-present generalized political obsessiveness. It’s essentially this: Hillary Clinton doesn’t just (hire people who) know the inside jokes to use on Twitter, she knows the inside jokes on Weird Twitter. And this is an attitude that reflects her campaign’s larger strategy; a bet that the so-called “national conversation” isn’t the thing that will carry Clinton to victory in the general election, as Emily Schultheis put it last year. Instead, her campaign is betting on making more intimate connections with small groups of voters, “the persona she builds in key areas, and the buzz she generates with local activists.” For anyone who has seen Clinton engage with a small crowd—and how warm and funny she can be, contrary to popular opinion—this approach will make sense. 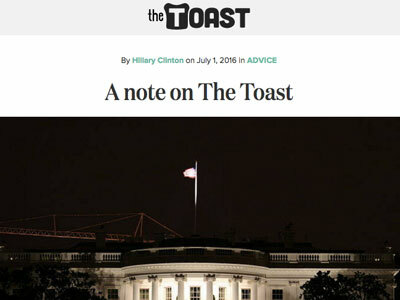 Clinton’s campaign has emphasized the importance of “meeting people where they are,” and it turns out that some of those people are online reading The Toast. You can read the note for yourself here.